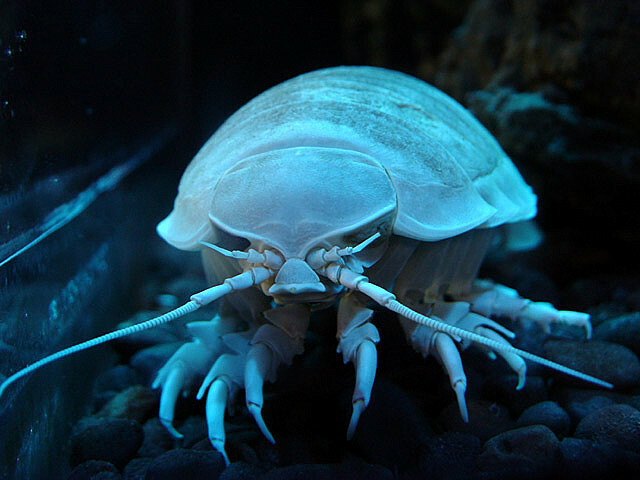 There are 20 known species in the genus Bathynomus; B. giganteus, or the giant isopod, is the biggest. Yes, they're kind of creepy looking. But they're also kind of cute! Here are a few things we know about these Internet-beloved creatures. They’re crustaceans, and are closely related to marine crustaceans like shrimp and crabs, and terrestrial crustaceans like the pillbug (Armadillidium vulgare). 3. They get big. Really big. Typically, giant isopods are between 7.5 and 14.2 inches in length, but they can get much bigger: One specimen pulled up with an ROV in 2010 was 2.5 feet long. 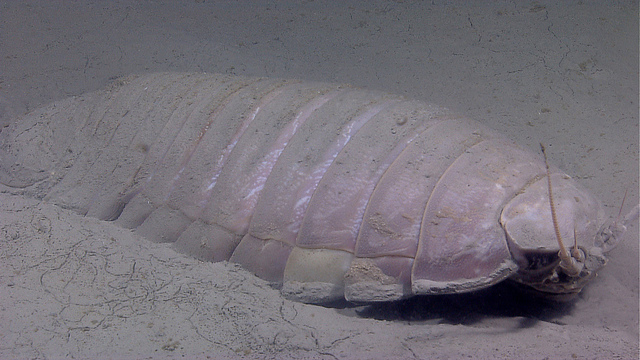 Scientists aren't quite sure why these isopods get so enormous, but believe that their huge size might be an adaptation that helps them survive the extreme pressure of the deep ocean. The giant isopod shell—which is comprised of overlapping segments—comes in two varieties: brown and pale lilac. Though they’re generally believed to be scavengers, feasting on dead animals that fall from above, some evidence suggests that they might also eat slow-moving live animals like sponges. Giant isopods also attack trawl catches. 6. They can go a very long time without eating. 7. But when they do eat, they gorge themselves. Giant isopods have four sets of jaws—which are adapted to cut and tear at prey—and they get a workout when the animals are hungry. “When they're hungry and they're eating, definitely have a lot of food around them, because they'll keep eating,” Auten says. “They'll eat a lot at one time and then they can go for a long time without eating. There’s a comic of one giant isopod eating a dead whale, and it eats the whole thing except for the bones. It's sitting on its back like ‘ughh I'm full now.’ That's totally true! If they eat, they eat a lot.” In fact, they eat so much that they compromise their ability to move. Still, they’re not aggressive feeders. “I've never had [an occasion] where they all ate at once,” Auten says. “I will make sure to bring enough food for all of them but whenever I feed them, it's one will eat at that one setting. 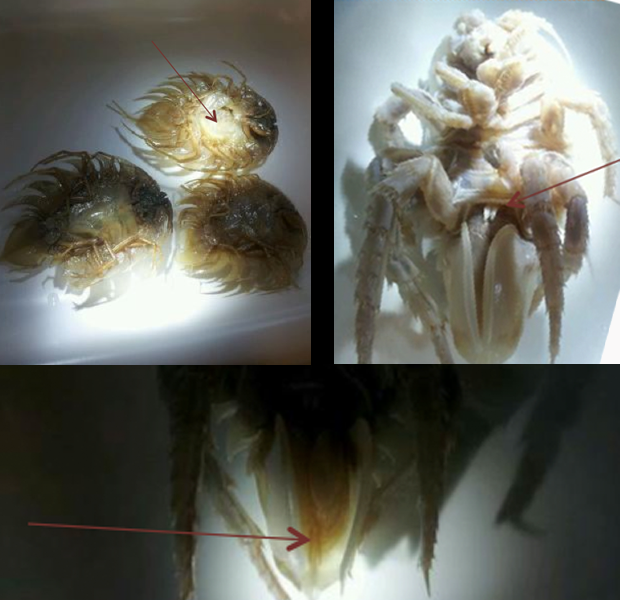 They definitely would not fight.” And apparently, they’re not picky: Three giant isopods collected in the southern Gulf of Mexico had ingested large quantities of plastic. 8. They live in a constant state of semi-hibernation. 9. They have something in common with cats. And it’s all in the eyes. 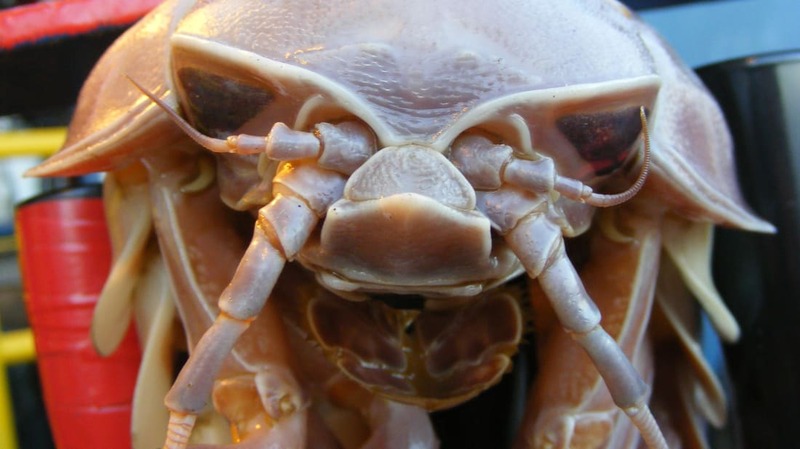 Giant isopods have widely spaced, fixed compound eyes with more than 4000 individual facets. Cats and the crustaceans (and many other animals) have a reflective layer at the back of the eye called the tapeum, which reflects light back through the retina and increases the ability to see at night. It’s also what makes cats' and isopods' eyes appear to glow. 11. ...So They Use Their Antennae. 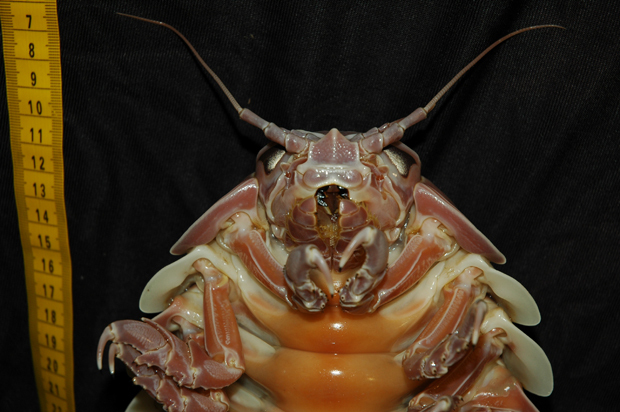 Giant isopods have two sets of antennae that they use to experience the environment around them. “The small antennas are used more for chemical sensing,” Auten says, “and they have large antennas that are used for physical sensing. When you put the food in front of them, you're letting them sense it, physically and chemically.” They might have a sensory receptor that responds to distortion in the water around them. 12. Want to tell males from females? Look for the peenies. Female isopods have a brood pouch, or marsupium, located on their undersides, where they hold 20 to 30 eggs (top right). 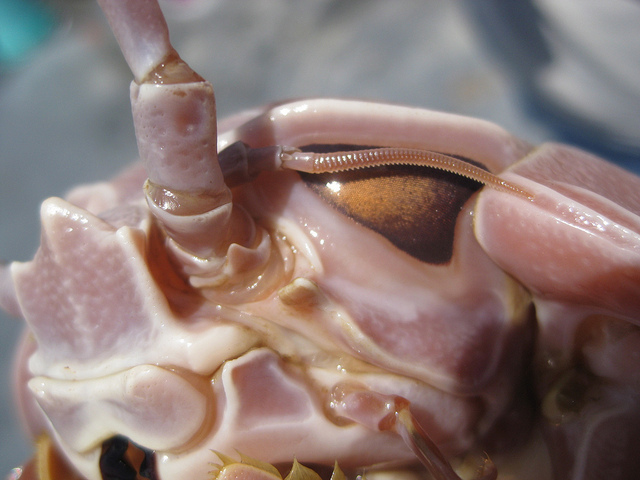 Males have two specialized organs: Small white appendages, called peenies (top left), that carry sperm (fun fact: smaller isopods usually have bigger peenies, according to Auten), and appendices masculinae (bottom), which they use to transfer sperm to the female. “They'll inject that sperm transfer organ anywhere within the female after she molts—because she's softer—and she's able to take on that sperm,” Auten says. 13. They have the largest eggs of all marine invertebrates. They measure .51 inches in diameter. Females don’t eat when they’re brooding; instead, they bury themselves in sediment to reduce energy use and to protect the eggs. 14. And babies come out looking just like big isopods. Juvenile giant isopods, or mancae, don’t have a larval stage; they’re approximately 3.4 inches long when they emerge and look exactly like adults. All they’re missing is the last pair of pereopods, or legs; when fully grown, they will have seven pairs of legs total. 15. To Grow, They Shed their Exoskeletons. 17. They curl up when threatened. 18. There’s a whole album dedicated to songs about them. 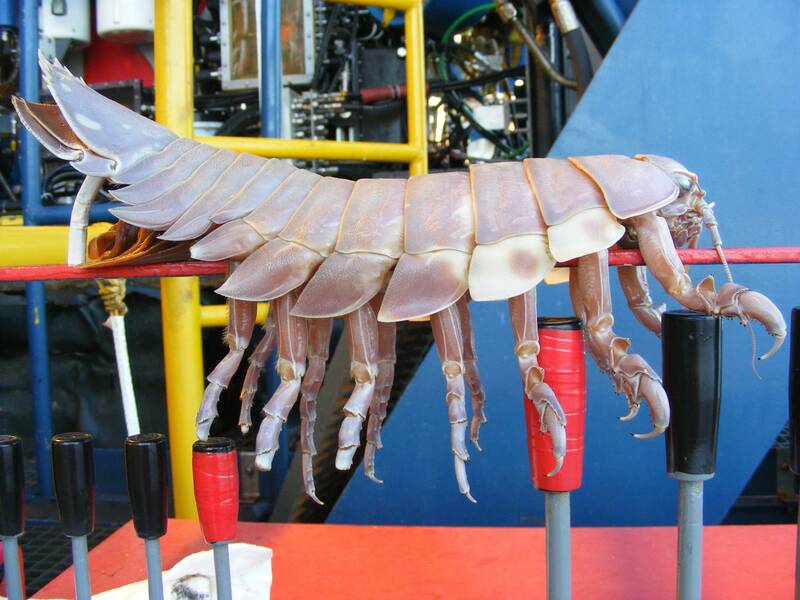 It’s called Songs About Giant Isopods, and you can listen to it here.